Mission Statement: Purely Poultry provides backyard flock owners, exotic and game bird enthusiasts, and meat and egg farmers with the selection, products, and knowledge that fulfills their fondest desires, conveniently online, at the right price, and shipped locally nationwide. Our professional, knowledgeable, and friendly staff will educate, problem-solve, and inspire our customers. Vision Statement: Purely Poultry seeks to offer more genetic treasures than any single hatchery. 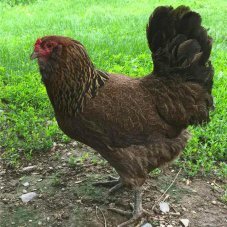 Purely Poultry offers rare and hard to find poultry breeds in addition to the popular commercial strains and offer great prices as well. Purely Poultry strives to be cost competitive wherever possible by building alliances with breeders that specialize in each type of bird. I am Tyler Danke, the owner of Purely Poultry. I am passionate about helping people with all their poultry needs. We are a family owned business. and read articles about Purely Poultry In the News. Purely Poultry views sustainability as very important. Read about our efforts to be sustainable. Purely Poultry has great prices on 300+ breeds of : chickens, bantams, ducks, geese, turkeys, guineas, peafowl, pheasants, ornamentals, chukars, swans and quail. We guarantee 100% live arrival. My start in poultry came from my parents having 25 laying hens. When my older brother started 4-H we started getting different kinds. When I was in high school we started Danke Bros Poultry a small rare breed poultry hatchery. The Danke Bros Poultry chapter in our lives have ended and I am now onto Purely Poultry. I am a lifetime member of the American Poultry Association and the Society for the Preservation of Poultry Antiquities. I am greatly supported and encouraged by my wife, Ruth and my son Noah. My main purpose is to lead others to Christ. Jesus Christ, both God and man, died on the cross and rose again. He died to save us from our sins. Those who believe this will spend eternal life in heaven; those who do not believe will be condemned. If you have more questions about this please contact me. I look forward to having a poultry farm of my own as soon as possible. Read about Danke Farms and the Avian Zoo. I started Purely Poultry because I know that I can serve my customers well. I combine a great offering of breeds at great prices. I see the opportunity to help people with their passions. I look forward to serving you in any way that I can!